Ships Monday, April 22 if ordered in the next 2 days, 7 hours and 6 minutes! Most refractometers used within the aquarium hobby are not specifically designed for reef aquariums and use an algorithm for the measurement of brine (NaCl - rather than seawater) and at a temperature of 15oC/59 0F rather than 25oC/77 0F. Thus, a measurement deviation of up to 1.5ppt is possible, which can have a significant adverse effect on coral growth and coloration. 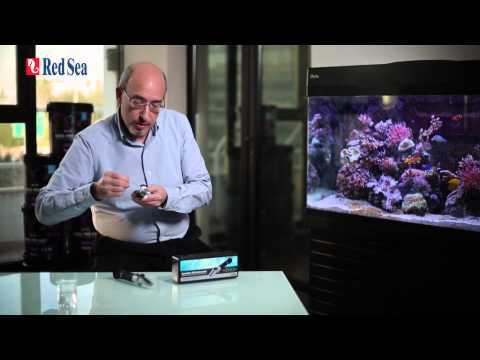 The PPT scale on Red Sea's Seawater refractometer is calculated using an algorithm for seawater and therefore will give a reading of the Absolute Salinity of seawater. The PPT scale on regular salinity refractometers are calculated using an algorithm for Brine. Using a Brine refractometer for Seawater will give an error of approximately 1.5ppt in the salinity reading. Calibrated for seawater (NSW) at 25oC/77oF, the normal temperature range for reef aquariums (most standard refractometers are calibrated at 15C/59F ). Salinity is a general term describing the concentration of salt in water. However, solutions of different type of salts have different refractive indexes. Brine is a solution of Sodium Chloride (table salt) that contains 2 chemical elements. Seawater contains approximately 70 chemical elements that include Calcium, Magnesium, Potassium etc. in addition to the Sodium Chloride. Seawater and Brine of the same salinity (i.e. the same weight of salt/liter) have different refractive indexes and will give different salinity readings if measured on the same refractometer. All transparent materials such as liquids refract (distort) light. All transparent materials refract light differently and have what is called a “refractive index” which means how much a particular material distorts light. Different concentrations of the same liquid have different refractive indexes. The scale of a refractometer is calculated by using a mathematical algorithm that relates the measured refraction to its concentration for a specific liquid. The refractive index of liquids change with temperature and therefore has a major effect on measuring salinity with a refractometer. The algorithm for defining the PPT (and S.G.) scale for a refractometer is calculated for a specific temperature. PPT readings from refractometers that are not calibrated for reef aquariums (i.e. 25oC) need to be adjusted according to a conversion table to give the actual PPT at the aquarium temperature. This is often a cause for misinterpretation of refractometer readings. For example, using a seawater refractometer calibrated at 20oC will give a PPT reading that is approximately 1-1.5ppt lower than the absolute salinity of the same water sample at the normal aquarium temperature of 25oC. Temperature is probably the biggest cause of wrong readings with a refractometer. Calibration and testing of water samples should be done after the refractometer and water sample have equalized at the correct temperature. Automatic temperature compensation (ATC) compensates for a few degrees of difference between the ambient temperature and the calibrated temperature of the refractometer. Larger temperature variations will give an error of approximately 1.0ppt in the salinity reading. ATC does not adjust the PPT reading of a refractometer to the temperature of the aquarium!